In Furniture > Dressers > Show & Tell. 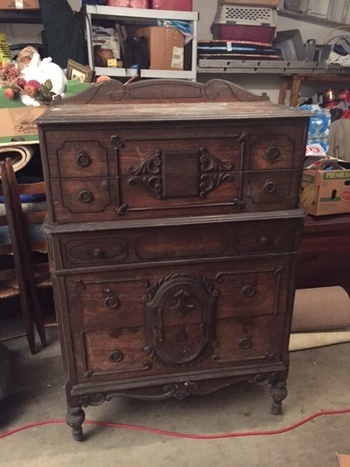 Can anyone tell me something about this dresser? I'm thinking early 1900's, maybe before 1930? It has all the original hardware. It was owned by a little elderly lady who was also the neighborhood Loan Shark. It's on casters (3 wheels are missing) with front decorations and veneer. Needs a quite a bit of TLC. You may want to look for hidden drawers or panels where the Loan Shark hid her money! Its hardly Empire, not even american empire. What a sham. Many bad elelments which do not match each other. Perhaps I should have filed it under "highboy". That's precisely why I posted it to this site, to get information. What do you mean by "sham"? No one "shammed" me and I'm certainly not trying to sham anyone. I just purchased a piece that I thought had potential, and wanted to learn more about it. When I was trying to look it up, several similar pieces popped up that were called Empire. I will certainly change the catagory. I'm learning little by little, and I hope the other folks on here are nicer than you, bladerunner22. I thought he possibly meant 'shame'. But on further reflection, I've changed my mind. It needs a lot of TLC. But, all in all I think it's something I would have in my living room. I like it a lot. Thank you so much Kydur, Michelleb007, and Gillian! I really appreciate the feedback. I have quite a bit to learn, and this site seems like a wealth of information. I did have the piece incorrectly catagorized under "Empire Dresser" - so my error can be chalked up to the fact that I'm still a novice. I changed it to "Highboy" to correct my error. This one does indeed requires MUCH elbow grease, but all in all, the bones are good, and I'm looking forward to the challenge:) Thank you again! "The most elaborate furniture in this style [true Empire] was made around 1815-25, often incorporating columns with rope-twist carving, animal-paw feet, anthemion, stars, and acanthus-leaf ornamentation, sometimes in combination with gilding and vert antique (antique green, simulating aged bronze).....Many examples of this style survive, exemplified by massive chests of drawers with scroll pillars and glass pulls, work tables with scroll feet and fiddleback chairs. Elements of the style enjoyed a brief revival in the 1890s with, particularly, chests of drawers and vanities or dressing tables, usually executed in oak and oak veneers. This Americanized interpretation of the Empire style continued in popularity in conservative regions outside the major metropolitan centers well past the mid-nineteenth century."